ONGC outlined plans to invest up to Rs40,000 crore in the Krishna-Godavari basin, off the Andhra Pradesh coast. The company aims to extract 25 million standard cubic meters a day of gas in the KG Basin by 2018 and will also look into exploration of oil by 2019 – positive for the company. 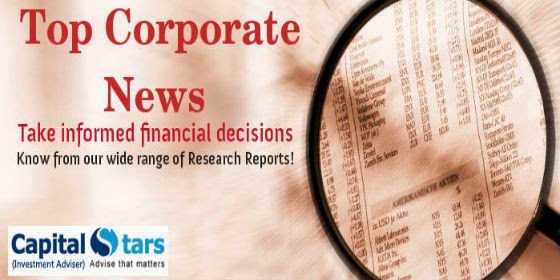 HCC won arbitration award of Rs217 crore, order book stands at 18000 crore – Positive for HCC. During market hours, HCC announced that the company has won arbitration award of Rs217.18 crore for extension of time (EOT) cost claim in Lucknow-Muzaffarpur National Highway Project after 20 months of hearing. RBI lifts lending curbs on United Bank of India – positive. The Reserve Bank of India ( RBI) has lifted lending restrictions put on United Bank of India and said the bank is free to lend, provided its capital adequacy does not fall below 9.5% under Basel-III and the credit–deposit ratio (CD ratio) should not exceed 70%. Shares of United Bank of India surged nearly 9% touching to Rs29.35, after the Reserve Bank of India ( RBI) has relaxed the prompt corrective action restrictions imposed on the bank on sanction of advances, participation in restructuring proposals. ITC -- Value Added Tax rate on cigarettes: Tamil Nadu, Kerala and Maharashtra and West Bengal (together contribute about 40% to ITC’s cigarette sales volume has not increase in VAT rate on cigarettes in their respective state budgets – sentimentally positive for ITC, but some other key states are yet to announce budget and will be keenly monitored. Glenmark Pharma gets SC clearance for selling diabetes drugs in India; positive. The Supreme Court of India has stayed a Delhi high court order restraining generic drug maker Glenmark Pharma from manufacturing sitagliptin, an anti-diabetes drug. While Merck and Indian generic drug manufacturer Sun Pharmaceutical Industries Ltd. Merck’s licensee for making sitagliptin in India, resisted the stay of the high court order, the apex court allowed the Glenmark Pharma to continue selling these drugs n India. The total market size of the drugs is pegged at Rs300 crore. Use our free Commodity tips package service to book high profits and learn to trade in commodity market. Subscribe our package to earn regularly.